Don’t be caught off-guard by an emergency admission to the hospital. Keep this convenient kit for both men and women at hand. 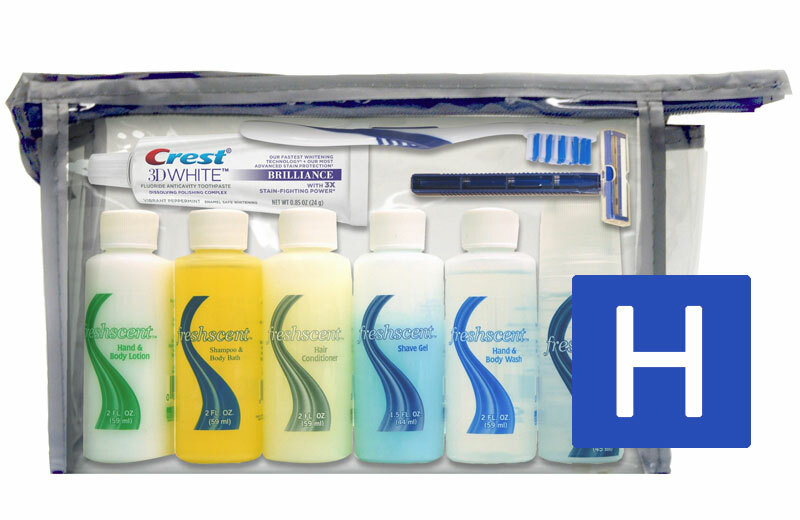 It includes all the toiletry items you will need to keep clean and fresh. Contents include shampoo, body wash, hand sanitizer, bath gel and liquid soap. It also contains a toothbrush, twin blade razor, toothpaste, shave gel and an alcohol-free deodorant. 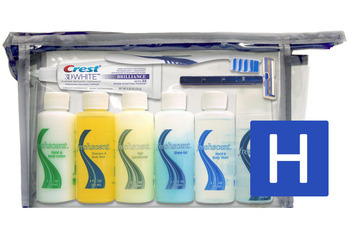 All supplies are packed in a reusable zippered nylon travel bag. 8" x 2" x 5"
Fresh Scent Shampoo & Body Bath 2 oz. Fresh Scent Hand & Body Lotion 2 oz. Fresh Scent Bath Gel & Liquid Soap 2 oz. Fresh Scent Shave Gel 1.5 oz. Fresh Scent Alcohol Free Roll-On Deodorant 1.5 oz.